Home › General › The Duck that Stole the Show. On January 19 we saw the very first Masters Swimming NSW BPS meet of the year hosted by Campbelltown Collegians AUSSI Masters Swimming Club. The Gordon Fetterplace Aquatic Centre in Bradbury is an exceptionally beautiful centre. The stunning 50m outdoor pool was the prime place to be during a blistering summer heat wave. 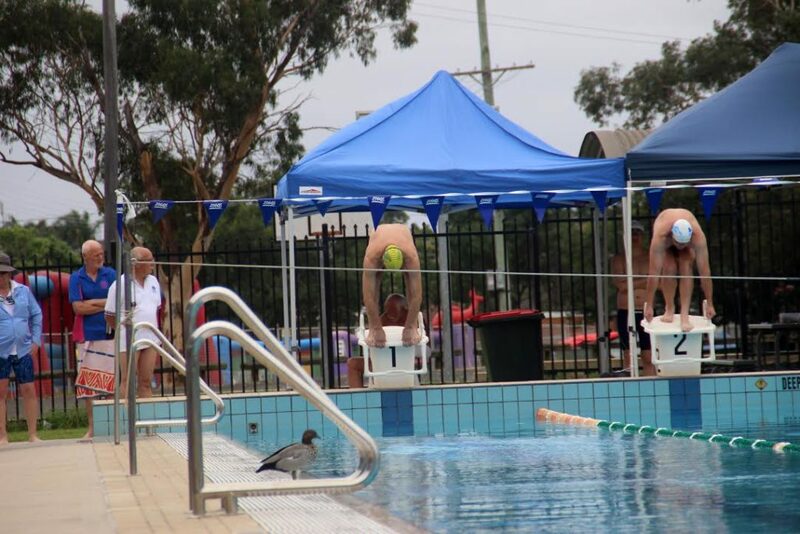 One of Bradbury’s locals took the plunge on this day, competing in her first ever Masters Swimming carnival. The local, known only as ‘The Duck’ definitely stole the show, racking up some points of her own amongst the competing swimmers in the lanes beside her. The duck was certainly the highlight of the carnival. From one of the referees calling out “Greg, what are we going to do about the duck?” to others referring to the duck as a referee (the ‘Old Duck’) – the duck was the centre of attention as dozens either took its photo or tried a selfie with the duck! As for the duck’s swimming, it was certainly on the pace during the early heats of the 400m event. One competitor said it set a new lap record – in it’s class, of course. The duck certainly out-paced those slower swimmers! 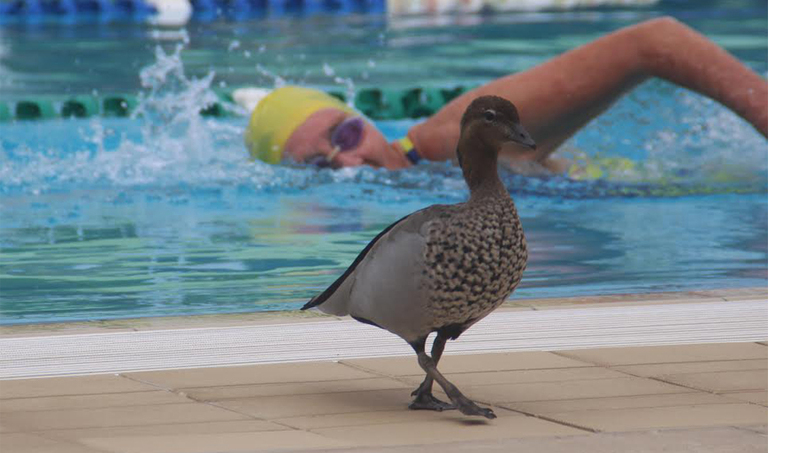 However, the duck was disqualified as the rules clearly state that a swimmer cannot change lanes – and that is exactly what Duckie did. 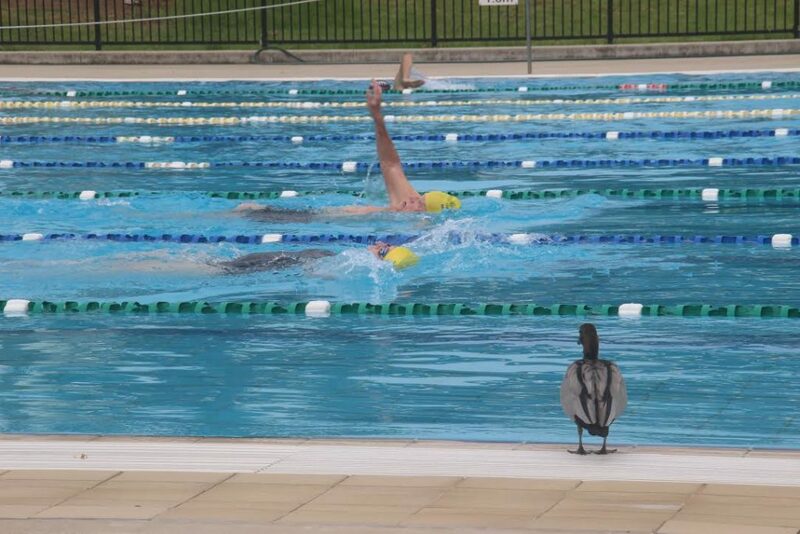 It was hilarious; as one swimmer approached, the duck simply skipped over the lane rope and paddled in the next lane! There was also a technical problem – every swimmer must touch the end of the pool before turning, something Duckie didn’t do. Personally I didn’t see an official fill out the required ‘pick slip’ when disqualifying a swimmer so, you never know, they may have let the duck off with just a warning. If that’s the case, then lap records and new 40m times will have been set. After about an hour, the duck gave up playing dodge-ems and settled into its new roll as a lifeguard, or referee, I’m not sure which. Hang on, yes I do know; the lifeguards were all young and since there were were numerous references to the ‘old duck’, it must have been a referee! Every half hour or so the duck would take another dip, then hop out and return to its refereeing duties. 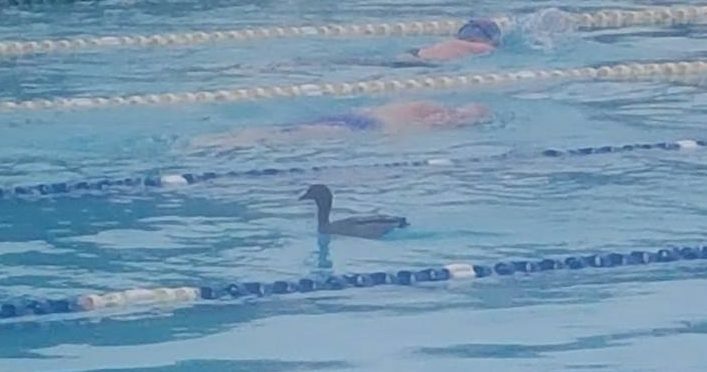 Prior to one heat of the breaststroke, the swimmer in lane 1 worried whether he would be disqualified himself, as there is a rule limiting swimmers to one per lane – and the duck was already in his lane! The sight of a burley swimmer charging down the pool soon had the duck heading for higher ground. Its was cute at the end of the carnival – once the racing had stopped and competitors moved away, Mrs Duck and the half dozen ducklings returned to ‘their’ pond. I suppose My Duck was just looking after the pond while all those pesky humans were using it.